Walkers help people remain mobile by providing assistance in walking. Walkers help with balance and provide a good deal of support. 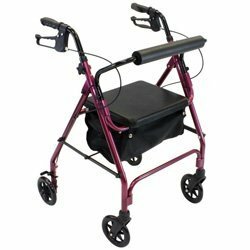 Available styles include folding walkers, wheeled walkers, seat walkers, and hemi walkers, which are designed for people who have the use of only one arm and hand. A variety of walker accessories are available such as walker baskets, pouches, and walker glides. Canes are used by people who are independent enough to use a one-handed walking aid, people with fairly good balance, and those who just need some added stability. Canes come in many shapes and sizes, with a variety of handles and grips, durable hardwoods or strong aluminum tubing in many colors. Let us help fit you with the cane right for you. A number of accessories such as cane holders, wrist straps, and ice grips are available. Cane tips provide secure contact between the cane and the floor. Crutches are the most appropriate walking aid when a person cannot bear any weight on one leg, such as with a broken leg, ankle or foot. Standard underarm crutches fit under the arms and are adjustable. Crutch accessories include handgrips, crutch pads, and crutch tips.